In a controversial move causing outrage among parents of toddlers all over Australia, Coles has officially discontinued its home brand dinosaur pasta. With the popular line now as dead as a dodo, frustrated parents are taking the supermarket giant to task, airing their dismay on social media. Toddlers quite literally live on this stuff, Coles. What on earth were you thinking? 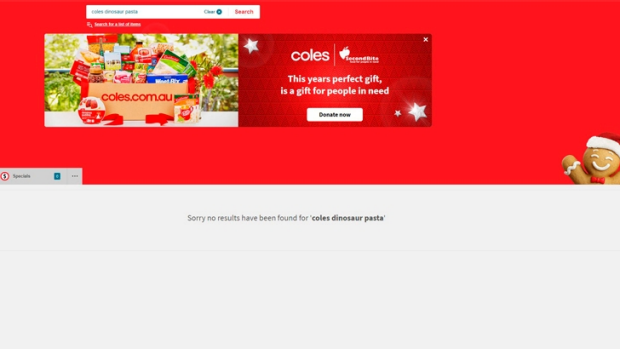 We went to the Coles online website and were met with this very disappointing outcome. The response from Coles, was posted on the Facebook post above from mum Kristy Russell, who enquired after the product. "Unfortunately the Coles Dinosaur Pasta has been deleted from our range. We understand how frustrating it can be to see a favourite product disappear from the shelf and we can assure you that this decision is not one made lightly. It's our job to provide customers with choice and value but with limited shelf space we have to balance providing choice with making sure the most popular products customers want to buy are available every time they shop. Keeping products that are not selling on shelf makes this difficult. We're sorry for the disappointment and we'll ensure your feedback is shared with our Merch Team so they're aware." In response, Kristy posted, "MUM LIFE. Seriously the twins have this with every dinner meal! We need Dinosaur pasta in our lives." Other similarly unimpressed people vented at Lunchbox Mums Australia. "It took me weeks to convince mister 4 to try different shapes. WHY WOULD THEY DISCONTINUE?" "My kids are absolutely devastated!" Others got proactive, emailing the company and messaging Coles on Facebook to protest the deletion from its pasta range. The good news is, that although it's more expensive Harris Farm sells animal pasta (500g for $5.99) so it might still be doable for an occasional treat. Still, we just have to ask, why Coles? Why?